Bethesda 365 » Day 11: Happy Hour Anyone? Day 11: Happy Hour Anyone? One of our favorite all-around good (but not too fancy) restaurant options in Bethesda is Cafe Deluxe. It’s located at 4910 Elm Street in the heart of town. They also have a restaurant at Tysons Corner in Virginia and 2 D.C. locations. Cafe Deluxe is definitely a local favorite and Friday – Sunday evenings, you will probably wait a while for a table. It’s a great place to go for Americana with class. Although they are known for their tasty fire roasted tomato soup and their Gruyère mac & cheese, they offer a delicious array of menu options for any palette. Herb-roasted chicken breast is apparently the most frequently ordered item on the menu and I can tell you from experience, it is worth trying! On the appetizer menu, Brian and I most enjoy the crispy chicken spring rolls served atop a tangy sauce that is to-die-for. We also love to get the steak Caesar salad with lots of ground pepper on top! 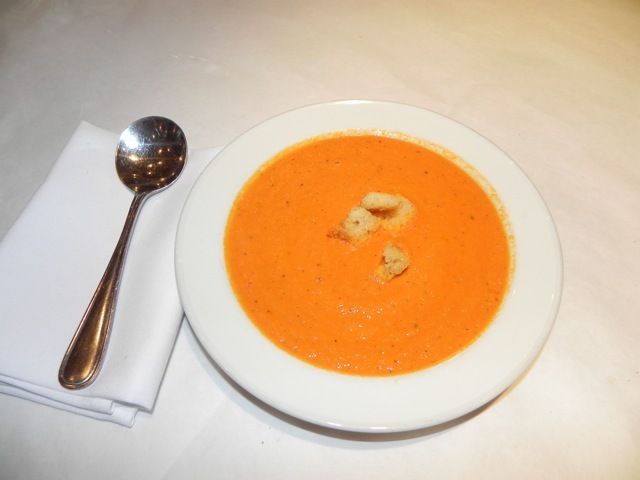 Fire roasted tomato soup - a Cafe Deluxe favorite! Cafe Deluxe offers a weekend brunch until 3 PM (mimosas anyone?) and a weekday happy hour in the bar from 3:30 – 7 PM. It’s funny, I have never experienced either one but now that I know about it, I’m making plans! Happy hour on Friday anyone? The happy hour menu is quite appealing! I am dying to know what their “cheeseburger spring rolls” are like! I also discovered their frequent diner program – you know, typical rewards for porking out at their locations. A good deal for “regulars” like us. Located right around the corner from our RE/MAX office in Bethesda, we find that Cafe Deluxe is an ideal location for business meetings too. 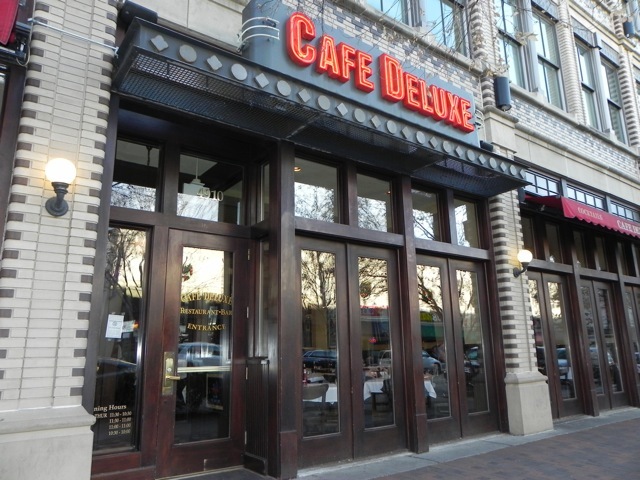 If you have been to Cafe Deluxe, let us know what your favorite menu items are as well. Maybe I will see you at happy hour! This entry was posted on Tuesday, January 11th, 2011 at 5:28 pm and is filed under Food and Drink, Restaurants. You can follow any responses to this entry through the RSS 2.0 feed. You can leave a response, or trackback from your own site.